Like many Torontonians, Dave Pearce and his wife Jennine Profeta are struggling to find an affordable home. They currently live in a one-bedroom apartment with their infant son and it’s getting cramped. “We need more room, and soon,” Pearce says. In the city’s highly competitive real estate market, where bidding wars are still common, home ownership has so far been unfeasible for the couple. But after a decade of staggering growth, the housing market in many Canadian cities is starting to cool—a trend economists and real estate experts suggest will continue through 2014. Prospective buyers like Pearce and Profeta are smelling opportunity, but they’re not sure how to take advantage. “If there’s a downturn coming, what’s our best strategy?” Pearce wonders. Like many Canadians, you’re probably wondering what all this means if you’re looking to enter the housing market, sell your home, trade up to a bigger residence, or downsize to a condo. MoneySense will help you navigate all of these scenarios and show you how to profit from the changing nature of Canada’s housing market. In Toronto, it’s the condo market that may be most vulnerable to a fall in prices, says Gulati. 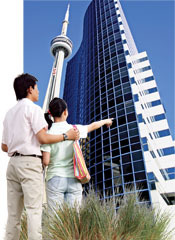 “The most recent statistics show there are more than 100 condos being built in the Greater Toronto Area. By comparison, there are 59 being built in New York City and 22 in Chicago.” Campbell agrees this large supply coming into Toronto in 2013 will outstrip demand, and feels first-time buyers in Toronto may soon find big opportunities in the condo market. The biggest advantage Canada’s changing housing market will offer first-time buyers is the luxury of time. “In places like Toronto you might have a bit more breathing room to look at a place and think about it for 24 hours without having to shove an offer in with six other people and hope you win,” says Jane Londerville. “So it gives you a little time to do some careful thinking.” Even in her town of Guelph, Ont., bids can be aggressive for downtown properties, so buyers in smaller centres can expect to benefit from less competition, too. If buying is still out of your reach in a cooling market, focus on building up a sizable down payment, suggests Heather Franklin, a fee-only planner in Toronto. A 20% down payment will save you thousands in reduced mortgage payments, lower interest rates and mortgage insurance premiums. “For those first-time buyers, just wait it out and build up your payments,” she says. It helps to understand what type of seller you are: willing, anxious or desperate. “The willing are the ones who are testing the market,” says Silverstein. He advises against anyone doing that now, especially as we head into winter, the slowest season for real estate. “Only the real sellers are in the marketplace right now: the anxious who have a greater need to sell and may have to put the house on the market; and the desperate who have to sell, whether it’s due to divorce, job loss or whatever.” Desperate sellers may be forced to accept a low price, but Londerville notes that if they’re moving to a market that is also down, things could balance out. Polly Chow and Wilson Luk are contemplating an upward move from their two-bedroom condo in Vancouver, which they purchased in June 2011. “We would like the opportunity to upgrade within the next few years if the housing market cools, and we have saved up a down payment,” says Chow. They’re considering looking at a townhouse or a duplex that could provide a steady rental income to help pay a bigger mortgage. Heath recommends anyone thinking about renting out part of their home or purchasing should keep in mind that any financial rewards will be tempered by the time and energy you devote to your tenants. It’s been 10 years since Dearl and Sharon Alexander’s two adult children finished university and moved out their mortgage-free home in the Ottawa suburb of Orleans. Now the couple wants to downsize and they’re wondering what to do in the current environment. Should they buy or rent a smaller home or condo? They also wonder whether they should keep their current property and rent it out, which would require repairing the back patio, redoing the kitchen and getting rid of the carpet and linoleum floors. “Is it worth the money and the trouble?” asks Dearl. If you’re in a situation like the Alexanders’, your first priority should be doing what’s right for your lifestyle, not trying to pick the perfect time to move. “It’s very hard to time the market,” says Jane Londerville. If couples are committed to selling their homes, they shouldn’t hold off for long, she says. If house prices do start to fall, it may be years before they rebound. As to whether the Alexanders should drop a bundle on upgrading their current home prior to downsizing, that’s something real estate agents typically advise because it makes a house easier to sell, says Heath. Don’t, however, expect to get back every dollar you spend. In particular, upgrades to kitchens or bathroom can backfire because new buyers may have different tastes. Generally speaking, if something is falling apart you fix it, says Heath, but think hard about doing anything else.